Q-Disc 3.0The Ultimate in Bioenergetic Harmonization of Your Cell PhoneAn ultra-thin, high polarity disc for all types of cellphones. 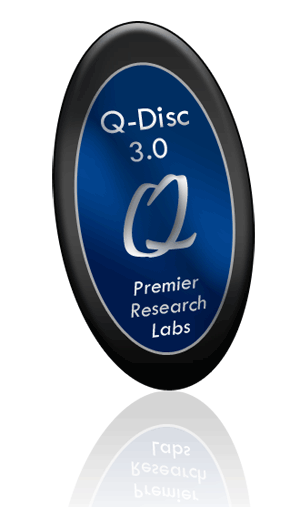 The third generation of the Q-Disc is updated to address the increased bio-field stress output of newer cell phones, such as the iPhone, Galaxy, etc. Convert Cell Phone Frequencies into a Beneficial FrequenciesIn creating this disc, our goal was to bioenergetically protect the cellular biophotonic communication of the wearer from all types of cell phone emissions. Through many trials and tribulations, we were pleased to finally discover the power of paramagnetic harmonic values via the use of a combination of earth-based elements. We have found that the Q-Disc doesn't neutralize the damaging EMFs but it converts them into beneficial frequencies that actually up-regulate the bio-field of the wearer. EMFWe have found that a 30-second cell phone call can disrupt and weaken every cell of the body for up to 18 hours! We feel that EMFs will be the plague of the 21st century, like cigarettes were last century. We are already seeing a huge spike in brain cancer and we are convinced that is related to cell phone usage, as perhaps are many other diseases. Protecting yourself is not an option but an urgent necessity. It may be the single most important step you can take to protecting your health. And it's easy! The Q-Disk is such an advancement that it not only protects you from the EMFs but converts the harmful field into a beneficial field. So you actually receive a treatment while on the phone! Recommended Use:Gently clean the exterior surface of the back of your cell phone to eliminate any dust or grime. Then simply peel off the adhesive on the back of the Q-Disc 3.0 and firmly place the Q-Disc 3.0 on the back of your cell phone, approximately in the middle. Once the Q-Disc 3.0 is affixed, you may not remove it without loss of it's internal contents.